What is your speciality amongst the OCG team? 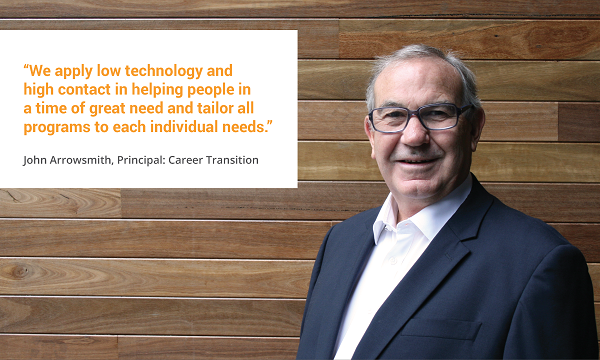 As Principal of the Career Transition I am across the issues of helping people find their core skills and look for roles that maximise their capabilities and gain the outcome in relation to that they are looking to achieve. What do you believe OCG stands for? A genuine commitment to treating people with empathy and respect. Using our extensive experience to help them re-enter the workforce, we support them every step of the way. We understand that this can be a time of high stress, and work to alleviate this as much as possible. How do you believe OCG is different? In the career transition we apply low technology and high contact in helping people during a time of great need and tailor all programs to each individual needs. Who do you support in the AFL? My grandfather was transferred to Melbourne with work and quickly understood that if you did not support a VFL side then no one would speak to you on Monday mornings. He selected Fitzroy and took his 4 sons to the game at the Fitzroy ground. By half time a brawl had broken out and he was trying to protect his 4 sons. He went to work on Monday and asked where is a safe place to take 4 sons to watch VFL and the answer was the MCG. We therefore all support Melbourne. If you are looking for your next career move within a new or your current industry, talk to John about how we can make your transition a smooth one.